Week 8/52. School vacation week flew by. Plans were made and then broken. first flu symptoms a friends house, then my sister finding she had pneumonia, Cecelia having hives all over her face, and last a nasty stomach bug running rampant through her daycare. It was not a good week for trying to keep to a schedule of events, for none of them really happened as we had envisioned. Time was carved out for a little trip down the Portland Museum of Art, and walks were taken as often as possible. 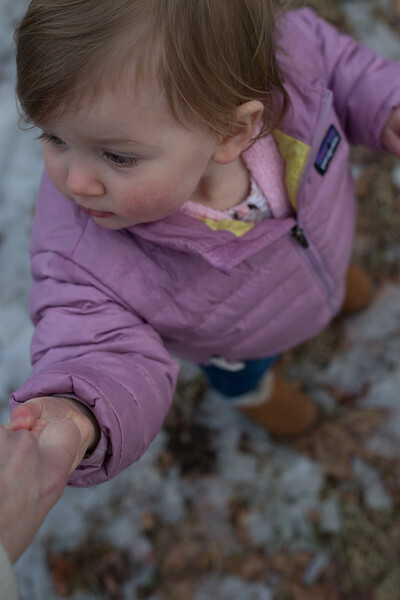 Cecelia loves putting on her little boots and stomping around outside, grasping two of my fingers for balance over the small mounds of remaining snow and ice. We watch Adelaide run ahead and I am happy Cecelia still needs me and reaches for me when she starts feeling off balance. These moments are the little ones that fade away so quickly as she becomes more independent, it was only a few months ago that she needed both of my hands to walk around. Already she wanders off on the flat muddy ground to explore on her own and when spring has fully arrived I may find my little hand holder even more of a rarity. For now I will try to memorize the feeling of her tiny hand in mine and feel less of the bitter, more of the sweetness of her trust in me resulting in this independence. Adelaide spotted this sculpture of a 7 as we searched for a parking spot on the streets of Portland. We debated from what material it was made, and her guess due to the color was wood. Being older, and having 4 years of Art college behind me, I suggested metal, now covered in rust, as the material of choice. She didn't think that sounded possible, so we agreed to wait until we reached the museum and could get up close to make a final prognosis. Once parked we made the long trek up the hill and then rested while making our examinations. Rusty metal it was, and reasons for material choices were thought up. We only made a quick round through two sections of the museum before the pull of family day paper crafts won out over other artists' paintings on the wall, their beauty not quite enough to tempt a 5 year old artist who loves to create her own work whenever possible. It was a beginning, and if the recollection of even one work of art inspires her down the road, then we have achieved all I could hope for. For me, the triumph of leaving the house at the end of a crazy week and making a memory doing something together is enough.